Former New York City Mayor Michael Bloomberg called President Trump “a threat to our country” but warned, “We cannot allow the primary process to drag the party to an extreme that would diminish our chances in the general election” and give Trump four more years. 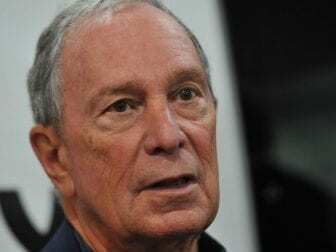 Bloomberg, who was first elected mayor of New York as a Republican, opted out of a growing field of Democratic candidates. Bloomberg served as mayor of the country’s largest city from 2002 until 2013. He switched parties to Democratic and independent during his tenure but has typically supported more liberal social causes. Bloomberg called President Trump “a threat to our country” and said that “New Yorkers know a con when we see one.” But Bloomberg also warned, “We cannot allow the primary process to drag the party to an extreme that would diminish our chances in the general election” and give Trump four more years. A presidential run could have caused complications for his ownership of Bloomberg News. And some of Bloomberg’s past policy positions while New York mayor could have also proved problematic. He has been heavily criticized for the implementation of stop-and-frisk policies by police, which disproportionately targeted African-American and Latino men. Bloomberg has flirted with a White House bid before, including weighing whether to run as an independent in 2008 and 2016. But, he ultimately decided a third-party bid wouldn’t be viable. And as former Starbucks CEO Howard Schultz has also flirted with an independent run, Bloomberg cautioned him against such an idea. However, after Bloomberg’s own announcement that he wouldn’t run this time at all, Schultz argued that the former New York City mayor’s decision not to run as a Democrat showed that the only way forward was as an independent if a middle-of-the-road candidate was to be successful.